Fires involving structures occur every day, including homes with pets inside. 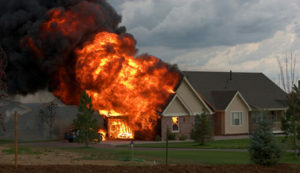 Do you know how to react when faced with a home fire? Did you know that animals tend to hide when they are in a panicked state and may not be able to escape a burning home on their own? Here is a Fire Escape Plan that you can implement for the safety of your pets. 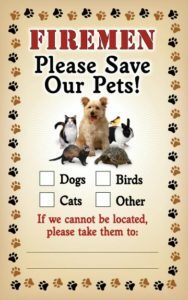 Notify rescuers of any pets in the home: You can purchase “pet rescue stickers” to be completed and placed on the front window of your home to alert firefighters and rescue workers how many and what kind of pet are inside. That way even if you are not there, rescuers know to search for your pets. Design a fire escape plan: It is important to know where your pets usually are. What are their favorite places? Where do they tend to hide when scared? 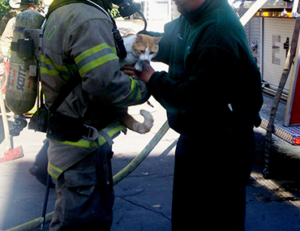 In an emergency like a fire, there will not betime to waste looking everywhere for your pets. You must have a concrete search plan with at least 3 locations where your pets can be found. This entails creating a layout of your home and marking your pets’ “go-to” locations. You should also survey your home to identify potential pet hiding spots and indicate them on your layout. Be prepared: Keep all equipment you would need while escaping a fire close together. For dogs that would be leashes; for cats or other small animals that might be carriers. Make sure these items are always put in the same place and are easy to get to. Don’t bury carriers in the attic or the back of a closet. In a fire, there won’t be any time to hunt for them. Fires are life and death situations – rapid response is critical! Practice makes perfect: Once you have laid out your plan, you will need to practice it using different scenarios. For example, practice what to do if the fire is in the kitchen; then if the fire is in a bedroom, and so on. You should go as far as to practice your escape with your pets from a second story using a ladder. (If you don’t have an escape ladder you should get one, as well as the appropriate equipment needed to assist you carrying an animal down a ladder.) Practice finding your pets. Start outside, rush into the house, find your pet, and take them outside. Repeating this drill can help animals become familiar with process. You may even be able to train dogs to go to a certain area outside when the smoke detector rings. Continue practicing until you are comfortable with your fire escape plan and it works efficiently.